We guarantee that CostumeDiscounters.com offers the lowest costume prices on the Internet. We're so confident that we have the lowest prices, we offer our Lowest Price Guarantee. If you find the identical costume elsewhere within 10 days of purchase at a lower price, we will match the costume price and take off an additional 20%! The Blue Crayola Crayon Costume is the costume your child needs to make their mark this Halloween. 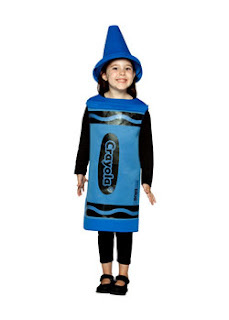 The Blue Crayola costume includes a blue tunic with the signature Crayola wrapper graphics and a pointy Crayon hat that looks just like the tip of a Crayola Crayon. With the end of Summer winding down (where did the time go?! ), we are currently getting ready for the upcoming school year in our home. While considering everything that we need to get for Back to School, it dawned on me a few weeks ago to start to consider Halloween costumes for the kids. I know ambitious right?! I'm normally a last minute kinda' gal, but who needs the stress of waiting until the last minute?﻿ NOT I! The kid's quickly settled on a theme for the year, each decided to be their "favorite thing's". The princess is super crafty, and rarely goes a day without picking up a crayon, marker, paintbrush, or some other crafting tool, so she set off to find a costume that was centered around art. After browsing through the extensive selection of funny costumes on the Costume Discounters website (all extremely fair priced! ), she settled quickly on the Blue Crayola Crayon costume (available in infants, children's, and adult sizes). The costume arrived quickly, and is just as pictured (pictured above)! The small fits her perfectly, and she's very tall for her age (4). We couldn't be more pleased with this incredibly cute costume! CostumeDiscounters.com is a one stop shop for all of your family's costume needs this Halloween. Wonderful quality at incredible prices!